Courtesy of UNESCO’s World Heritage Centre. UNESCO’s World Heritage Centre released its global scientific assessment of climate change impacts on World Heritage coral reefs. 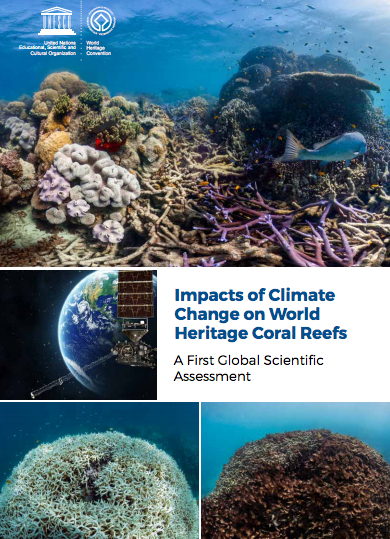 21 of 29 World Heritage reefs are being subjected to severe and/or repeated heat stress that has led to some of the worst bleaching observed at iconic sites like the Great Barrier Reef in Australia, Phoenix Islands Protected Area in Kiribati, Papahānaumokuākea in Hawaii, Belize Barrier Reef Reserve System in Belize, Tubbataha Reefs Natural Park in the Philippines, the Lagoons of New Caledonia in France, and the Aldabra Atoll in Seychelles. Its analysis predicts that all 29 coral-containing World Heritage sites would cease to exist as functioning coral reef ecosystems by the end of this century under a business-as-usual emissions scenario. To download the free publication, visit here.